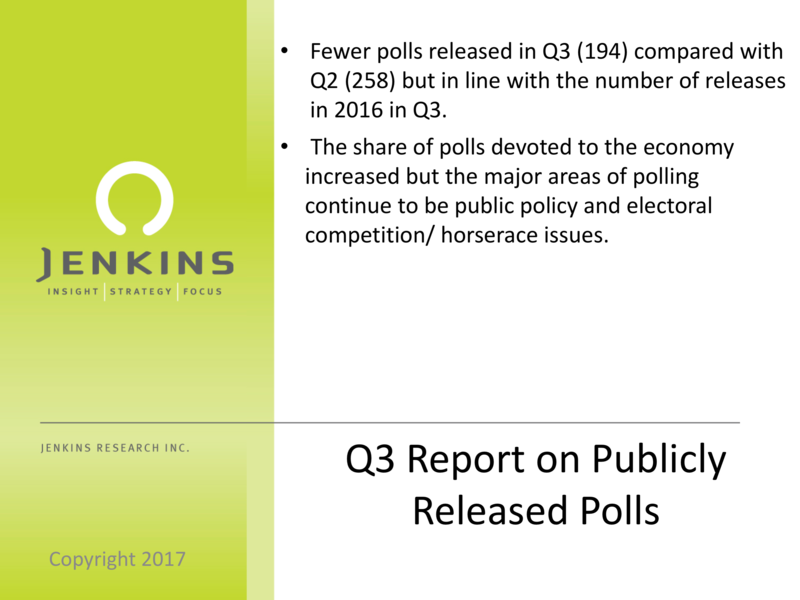 Public policy dominated Q3: A look at publicly released polls | Jenkins Research Inc.
Q3 saw an expected decline in the number of polls released into the public domain from Q2 as the summer broad less polling activity. This aligns well with the 2016 summer result. International trade and relations were top topics of national public policy polls as polling companies and the media turned their attention to NAFTA and the other international issues. Elections in Alberta in Q2 contributed to the number of releases that were primarily about electoral/ party competition issues but overall Q3 saw a fewer share of these compared with Q2. 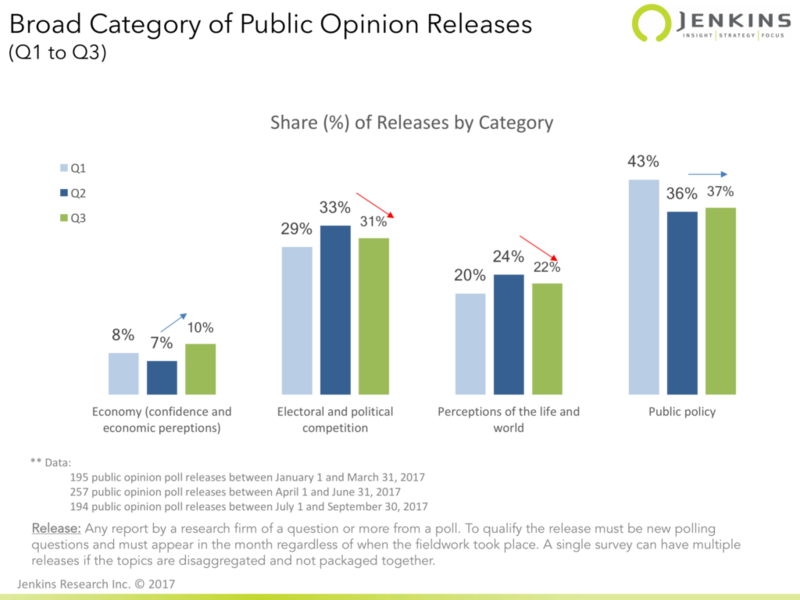 The share of releases associated with perceptions of life and world we live in also dropped at the expense of economic issues, which was the main area of increase. In fact, 49% of all non-national releases were about the political competition (though there may be some issue content here) in that geography. Only 19% of national releases are about electoral competition. The difference reflects the fact that there are so many potential political/ party races at a sub-national level and these competitions are being monitored and reported on but the local policy issues are less likely to get exposure. The public is more likely to be exposed to how their peers think about national issues than they are for provincial or local issues. This leaves them to, perhaps, extrapolate from national results and/ or rely on other filters to understand local/ provincial issues. Public policy remained a major area of polling with 73 releases (49 national). The top categories for national policy releases were issues of international trade (16%) and international relations (14%), followed by drugs and alcohol (8%), refugees and immigration (8%), taxation (8%), democracy and governance (6%).